Rear 4-port SATA3.0 interface for easy wiring. 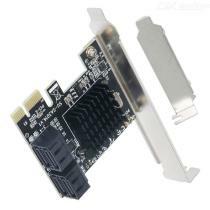 Compliant with PCI-Express v2.0 specification, backward compatible with PCI-Express v1.0. Support Gen 1i, Gen 1x, Gen 2i, Gen 2m, Gen 2x, and Gen 3i. Supports FIS based on port multiplier switches or command switches. Heatsink: with a big heat sinks for long time safe working.